We're on our way to Howell Living History Farm, part of the Mercer County Parks Department. 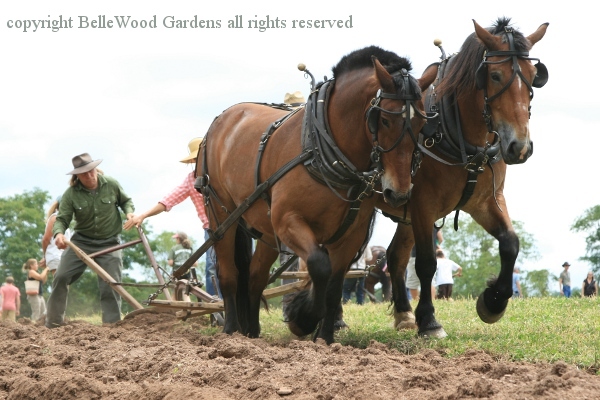 Today is their 31st annual plowing match. We had such a good time last year that we're not just back again but a couple of friends knowledgeable about horses came too. It's the fine plowing, where teamsters are judged on the quality of their plowing and the working of their draft team. Plus, I really like the horses. First, what the plowman does. Are the furrows straight and of uniform width and depth? Is the stubble turned under? 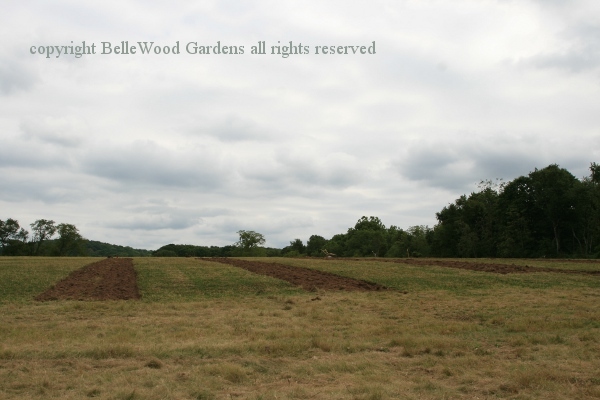 Are the ends of the furrows even or do the ends give the plowed land zig-zag appearance? Next, the team: do they pull evenly and walk at a steady pace? Is the team responsive to the driver's voice commands and driving lines? Are the animals sound, well muscled and fit? And lastly, the equipment: is it well maintained with clean harness or yoke, in good condition and properly adjusted? Today it's hard work, even more than usual because it's been very dry. How many legs can you count? 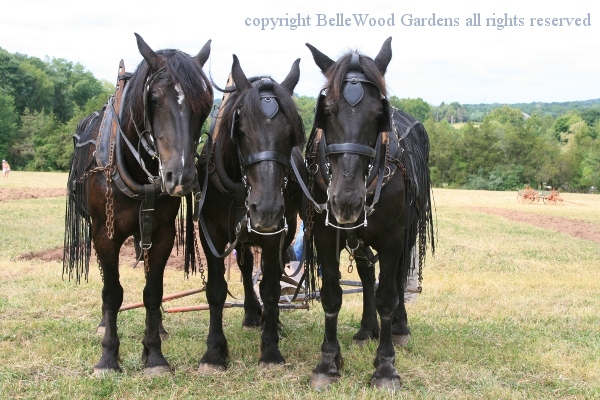 Three black Percherons. 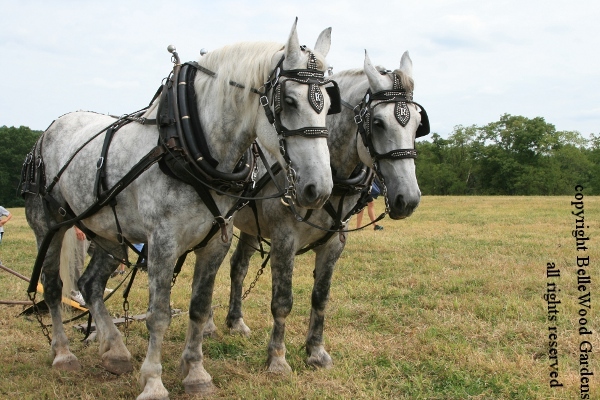 This year there are eight teams with a pair of draft animals, two teams with a three horse hitch. While teams are often matched for looks, it's really matching for performance that's more important. Ike, Jeb, and Annie, a team of Brabants, the Eurpean version of Belgians. I think that's Ike in the center - see his heavy neck and stallion crest. My friend Ann, who is knowledgeable about horses said, "A real credit to both the breed temperament and the owner/handler to be able to do that with stallions. They are beautiful horses." Or would you include this team as a trio? The darling little filly was foaled just two months ago, in mid-June. 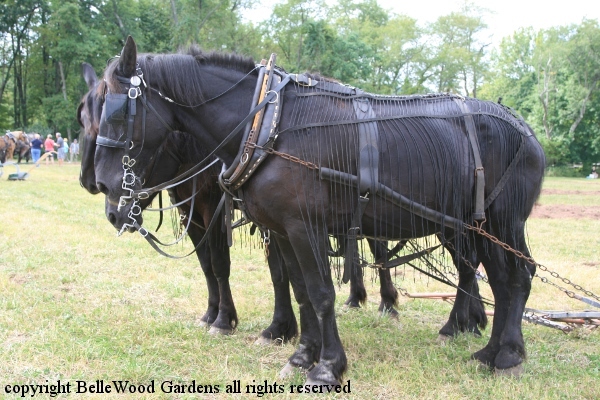 Draft horses, with their massive bone structure and slow growth mature more slowly than riding horses. She won't be ready for training until she's a three year old. Oh, she'll be taught her manners, then given ground work, but no plowing or hauling until she's four or older. 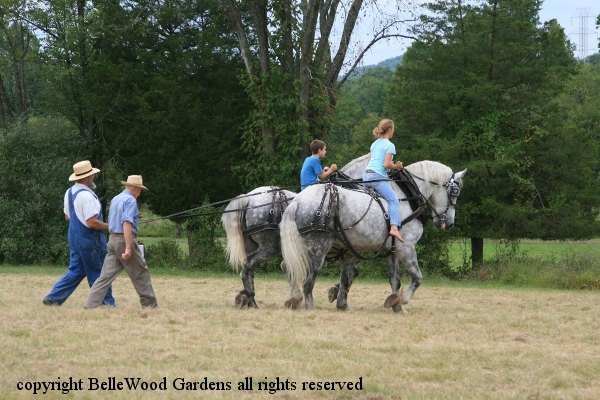 Daniel Ruth with Ted and Bud, his team of dappled Percherons. This picture brought back memories of a story my mother told me. When she was a little girl her family would go to a farm for a few weeks the summer. That's something people in New York City would do - a change of scenery, an escape from the heat. This time that she was telling me of, the farm had draft horses to do the work. At the end of the day my mother and her sister would try and get a ride. The horses had such broad backs that the little girls legs would stick out. And the horses, after a day's work, were not very interested in giving rides. So they'd find a tree with low branches and scrape the girls off. Clearly Ted and Bud were more agreeable. 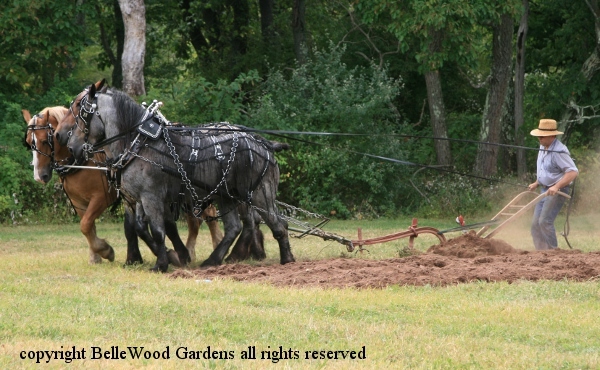 These are, I assure you, also dappled Percherons. 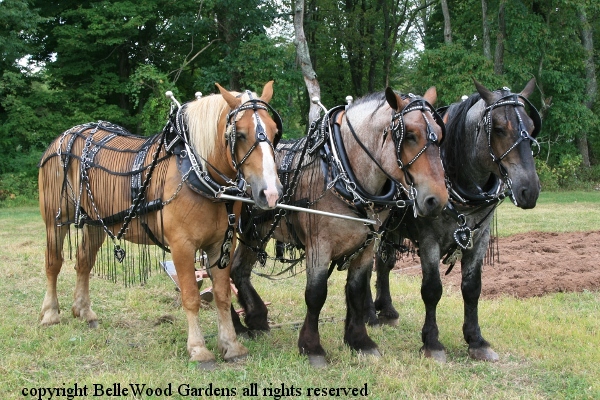 It seems that dappled horses, after they mature and as they age, become paler each time they shed their coats. So Gus and Ada, from Historic Longstreet Farm, have lost their spots. 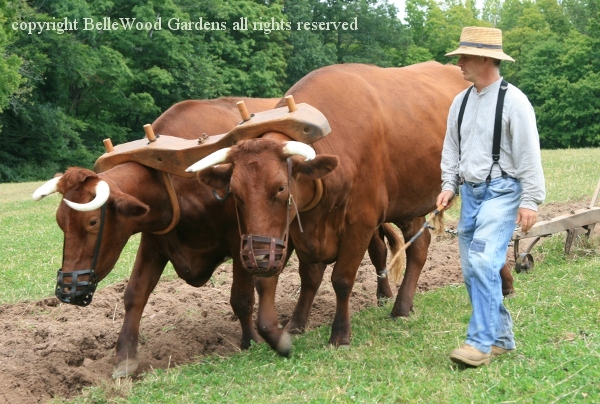 Horses were not the only draft animals and today Rob Flory is participating with Jim and John, the Howell Farm team of Milking Shorthorn oxen. 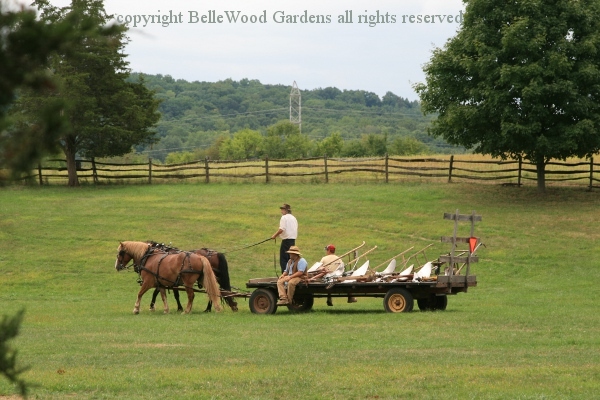 It's interesting to see the difference in equipment between horses and oxen. 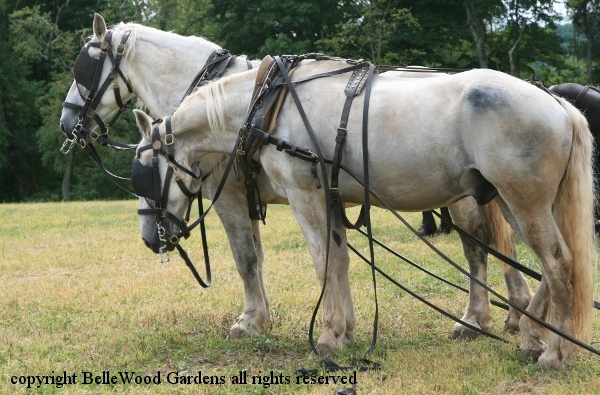 Horses have a collar and complicated harness, with an evener between the team's harness and the plow. 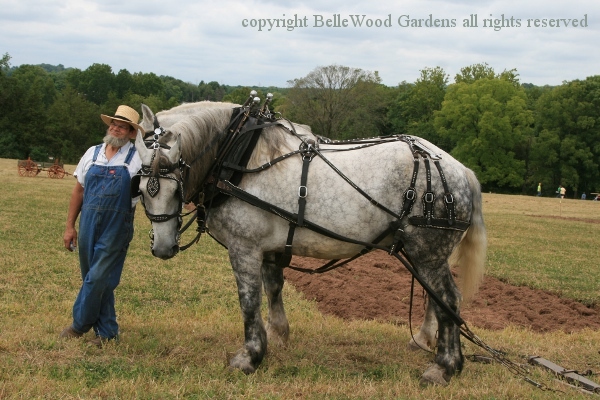 The plowman has the reins looped over a shoulder and across his back, under the opposite arm. The invention of the horse collar made a huge difference in the work a horse could do. With just a strap around the neck, the horse would choke itself each time it pulled. With a collar, the pressure is against the shoulders, a big improvement. 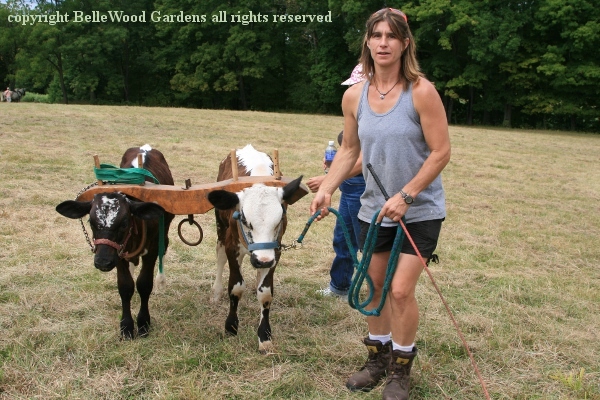 Oxen have a yoke and a simple chain that attaches to the equipment. No reins - oxen are guided with a whip. Not to strike but just a little flick used together with voice commands to to guide them. 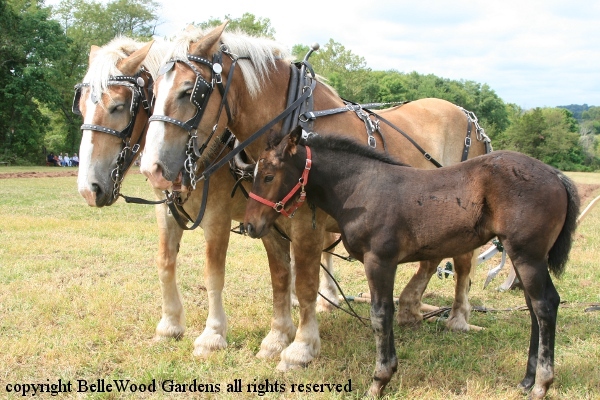 Don't misunderstand me, draft horses are also taught basic commands such as gee (turn away from the driver) and haw (turn towards the driver), start up to go, whoa for stop. Haw means something different here and over in the UK. Here, the driver stands to the draft animals left so animals turn left to the haw command. But in the UK the driver stands to the right of the animals so an English trained team haw to the right. In both cases, though, the team is turning towards their driver. Meet Marty and Max, two young Lineback oxen. 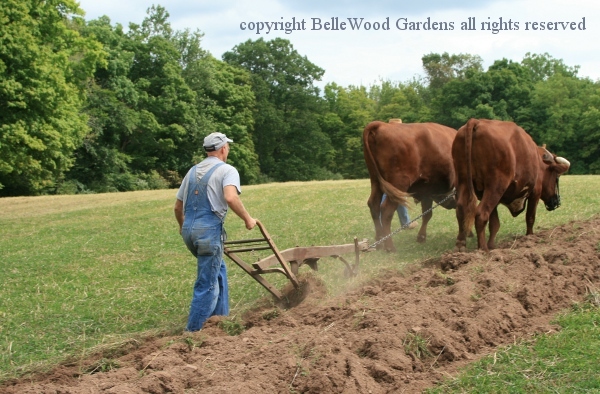 Notice that with oxen even the young calves are started off with a baby-size yoke. Plowing is over. Time to put the plows away, a rest break for the teams, time for lunch for all of us. In the afternoon there will be an obstacle course wagon driving event. 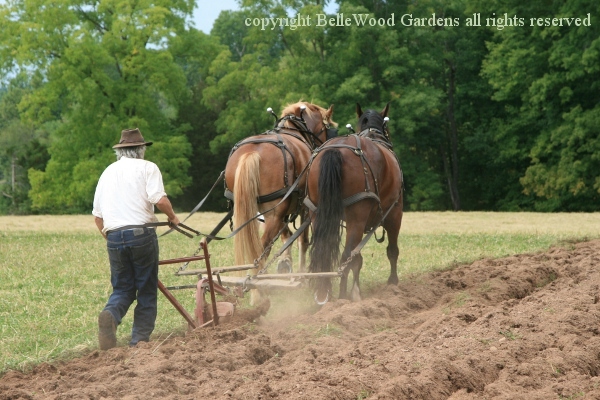 But for us and our friends the morning was the highlight of today's plowing match.